Marketing began in 2008 for the Adagio, a 9-story residential condominium building with 41 units at 243 West 60th Street. West End Development, an affiliate of LHL Realty Inc., of which Lawrence Ginsberg is a principal, is the developer. H. Thomas O'Hara is the architect and Andres Escobar has designed the interior spaces. West End also has plans for two rental apartment buildings with a total of about 300 units at the site, one 27 stories and one 17-stories. 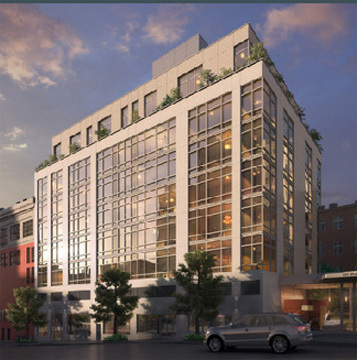 Linda Fenn, senior vice president Prudential Douglas Elliman, said that the rental buildings will follow the development of the Adagio. The building's apartments have fireplaces and 11-foot-high ceilings. Allmilmo Kitchens have appliances and fixtures by Sub Zero, Bosch, Dornbracht, Miele and Gaggenau with Ipe Brazilian hardwood floors, Caesar Stone countertops and Macassar wood complements and a wine cooler. Master baths have Allmilmo Wenge woodwork and vanities, Zuma tubs, radiant-heated limestone floors, rain-style showerheads, and Statuary Venatino and Thassos marble walls. The building has a lobby with a fireplace, a garage, a 24-hour doorman, a fitness center and a 40-foot indoor swimming pool overlooking a formal garden and a tennis court. Initial pricing for the one-, two- and three-bedroom apartments ranged from about $860,000 to about $3,000,000.